Exclusive! Something special! Thanks to a technique called "burnout", this uniquely Beautiful Burnout Tee features a sheer, tone-on-tone, floral scrollwork design in soft cotton/polyester knit. 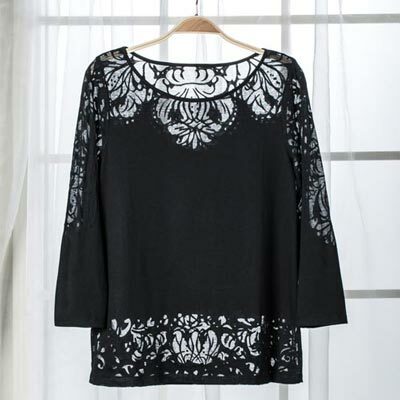 Easy, pullover style with three-quarter sleeves and scooped neckline. Machine wash. Imported. Misses, approx. 25"l.